For anyone who didn't get a postcard last time, would you like one this time? Sorry, the animal ones seems to be popular and have all been claimed ( I didn't get very many...), but I have a bunch of scenery ones. Who would like some post cards? 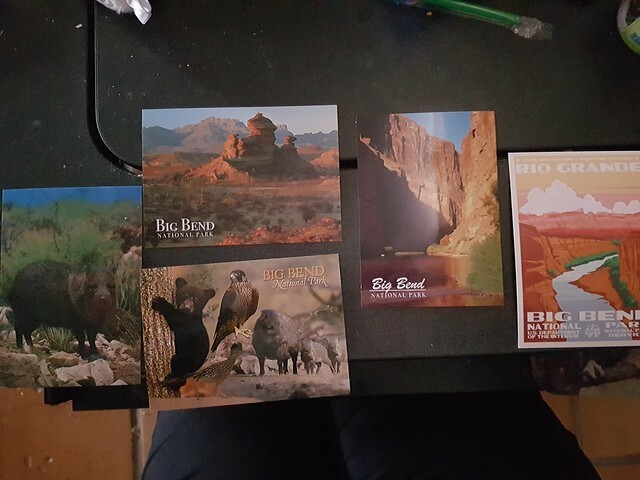 I bought some post cards in Terlingua and I would just love to send them to you guys! EDIT: I'm sorry, it seems like I didn't get enough postcards, so I've run out. Next time I'll send more! P.S. IF YOU WANT A SURPRISE, DON'T CLICK ON THE CUT . You can just tell me you want to be surprised. Also if you want a particular one, don't hesitate to claim one. Also if you don't want a particular one, please let me know! Don't worry if you live overseas, I will ship overseas, even through to the Russian pigeon post which may or may not take 3 months to receive your postcard. Comments will be screened for your privacy. Need to try the same thing with Hissy and see what she does. May hiss at me lol. Wanted to share it - https://solteronita.livejournal.com/1300873.html . 20. Song you know is overplayed/ overhyped but you dont care because you love it. 21. Song you remember was overplayed at a particular time but no longer is. Bon Jovi- Livin' on a Prayer. This song was voted as VH1's #1 song of the 80s. I remember watching the countdown something like 14 years ago now. It's played a whole lot, and it's fun song. Justin really hates Bon Jovi, I don't even really understand the reason. I think it's that "Cowboy" song that he especially hates. But I dunno 80s hair bands aren't everyone's thing. I think maybe "Bohemian Rhapsody" would have been a good choice here. I actually like Livin' on a Prayer more than Bohemian Rhapsody, I know, travesty. I'm actually looking forward to this week because again Supervisor will be out for all of it except for today. Already she's irritated me with something today because first thing she was asking if she could put this collection she's getting underneath the other set of processing tables across from me. There is really no where else for it to go. Everything has to sit on the floor somewhere because she's gathered so much crap that there is 0 shelf space for it and I constantly have to be moving boxes to get to other boxes and folders. She actually was supposed to view this collection in Austin and pick the stuff that was to come here, but no plans changed and it's all coming here. It has something to do with this Texas Park Ranger's materials. I feel like 90 percent of it will be garbage that should go into the dumpster, but any time anything makes its way in here, it NEVER leaves. It's going to go sit on the floor right next to these cut up newspapers from around 2014. They are duplicates of ones we have in our collections. I keep telling myself that soon it won't be my problem and I will never have to deal with it again, but it's like I haven't had a job offer yet. A lot of this weekend was dedicated to cleaning and I will admit that Justin did a lot more of it than me, but it's because he had to clean his room and he had a LOT to clean in there. New rental manager is coming over today to do an inspection/walk through. He complained that I did nothing, and maybe it felt like nothing compared to him, but I don't keep my room as a trash pile, so whatever. We argued again this morning because again he took forever walking out the door and made us late yet again. I am so tired of him doing this. I need to actually enact my threat of leaving him to walk to work. Diet is ok. I don't think I did great last week so I didn't really lose weight. No gain though, so that's nice. I'm afraid it will be the same this week because of my trip, so I'm going to try extra hard not to break my diet today- Thurs. <form action="//www.html.am/html-codes/textboxes/submitted.cfm"> <textarea name="myTextBox" cols="50" rows="5"> <h4>The Categorically Songful Music Meme</h4> <u>Colors</u> 1. Favorite song with a color in the title. 2. Favorite song by a band with a color in its name. 3. Favorite song which evokes a particular color. <u>Numbers</u> 4. Favorite song with a number in the title 5. Favorite song from a band with a number in its name. 6. Favorite song that reminds you of a particular age. <u>Shapes</u> 7. Favorite song with a shape in the title. 8. Favorite song that describes a shape in its lyrics. 9. Favorite song that evokes a particular shape. <u>Lyrics</u> 10. Song with your favorite lyric. 11. Song you judge to have the best lyrics. 12. Song with the worst lyric/s <u>They died too young</u> 13. Favorite song by an artist who died this year(2018) 14. Favorite song by a band you know would have gone far if a member didn't die. 15. Favorite song by a singer who died long ago. <u>Energizer Bunny</u> 16. Favorite song by a group who has been together over 30 years. 17. Favorite song by a group who has been together over 40 years. 18. Favorite song by a group you cant believe is still together. <u>Overplayed</u> 19. Song you think is overplayed/overhyped 20. Song you know is overplayed/ overhyped but you dont care because you love it. 21. Song you remember was overplayed at a particular time but no longer is. <u>Underplayed</u> 22. Song from band you believe is underplayed/underappreciated 23. Song you may have heard on the airwaves a couple times, but think it should be played more 24. Song you can't believe is never played. <u> Predictability</u> 25. Song you knew from first listen would be a hit. 26. Song you are not surprised became a meme. 27. Song from an album of a band that you believe needs to venture out (into new styles or genres) more. <u>Unpredictablilty</u> 28. Song that friends would be surprised you are into. 29. Song you do not believe belong to a particular band. 30. Song that became an unprecedented hit. 16. Favorite song by a group who has been together over 30 years. 17. Favorite song by a group who has been together over 40 years. 18. Favorite song by a group you cant believe is still together. I will go with Fleetwood Mac, who has been together in some way or another since the late 60s. Their lineup has changed so often, and now they are touring with Stevie Nicks singing. Lindsay Buckingham was supposed to tour with them, but he acted really immature in regard to Stevie (jezus their relationship ended 40 years ago) so they kicked him out. Now he's suing for wages he was supposed to earn while on tour. I actually am a big fan of Stevie Nicks and think she was their best singer. Maybe not necessarily most talented singer, but she always had such a stage presence. She also had a successful solo career and is the only woman to be inducted into the Rock & Roll Hall of Fame twice. Lol a lot of videos of Stevie from that era feature her and her huge wind-swept hair. 1. Favorite song with a color in the title. 2. Favorite song by a band with a color in its name. 3. Favorite song which evokes a particular color. 5. Favorite song from a band with a number in its name. 6. Favorite song that reminds you of a particular age. 7. Favorite song with a shape in the title. 8. Favorite song that describes a shape in its lyrics. 9. Favorite song that evokes a particular shape. 10. Song with your favorite lyric. 11. Song you judge to have the best lyrics. 14. Favorite song by a band you know would have gone far if a member didn't die. 15. Favorite song by a singer who died long ago. 24. Song you can't believe is never played. 25. Song you knew from first listen would be a hit. 26. Song you are not surprised became a meme. 27. Song from an album of a band that you believe needs to venture out (into new styles or genres) more. 28. Song that friends would be surprised you are into. 29. Song you do not believe belong to a particular band. 30. Song that became an unprecedented hit. If you would like to share this quiz, you can copy/paste! <h4>The Categorically Songful Music Meme</h4> <u>Colors</u> 1. Favorite song with a color in the title. 2. Favorite song by a band with a color in its name. 3. Favorite song which evokes a particular color. <u>Numbers</u> 4. Favorite song with a number in the title 5. Favorite song from a band with a number in its name. 6. Favorite song that reminds you of a particular age. <u>Shapes</u> 7. Favorite song with a shape in the title. 8. Favorite song that describes a shape in its lyrics. 9. Favorite song that evokes a particular shape. <u>Lyrics</u> 10. Song with your favorite lyric. 11. Song you judge to have the best lyrics. 12. Song with the worst lyric/s <u>They died too young</u> 13. Favorite song by an artist who died this year(2018) 14. Favorite song by a band you know would have gone far if a member didn't die. 15. Favorite song by a singer who died long ago. <u>Energizer Bunny</u> 16. Favorite song by a group who has been together over 30 years. 17. Favorite song by a group who has been together over 40 years. 18. Favorite song by a group you cant believe is still together. <u>Overplayed</u> 19. Song you think is overplayed/overhyped 20. Song you know is overplayed/ overhyped but you dont care because you love it. 21. Song you remember was overplayed at a particular time but no longer is. <u>Underplayed</u> 22. Song from band you believe is underplayed/underappreciated 23. Song you may have heard on the airwaves a couple times, but think it should be played more 24. Song you can't believe is never played. <u> Predictability</u> 25. Song you knew from first listen would be a hit. 26. Song you are not surprised became a meme. 27. Song from an album of a band that you believe needs to venture out (into new styles or genres) more. <u>Unpredictablilty</u> 28. Song that friends would be surprised you are into. 29. Song you do not believe belong to a particular band. 30. Song that became an unprecedented hit. that one quiz everyone's been taking. First have to preface this by apologizing for the grammar, im on the cellphone and there isnt an autocorrect function while on LJ. I dont seem to learn my lesson doing these cellphone entries. Several times something or other has deletes long entries which take a lot of time. Things at work have been pretty good overall. Last major altercation with Supervisor was in early March. Things between us have been peaceful since then, bit it's always the calm before the storm. Something always inevitably comes up and I do have anxiety anticipating what it could be. Something which could happen fairly soonish is something Ive been trying to decide is worth my effort or not. I've basically decided on the topic of my thesis. It is going to focus on two sisters living in a very small border town near here. Their entire family is incredibly fascinating, and for a while I was hoping to focus on their grandfather who was a fairly prolific writer. He had a major problem with the army presence in "his" town back during the Mexican Revolution days. He expressed his contempt by publishing a bunch of "circulars" in the local paper and then when the army was able to put a stop to that, financed his own printing so he could disseminate them further. His grand daughters were not as contentious and prolific, but they were very active in the community and very active as landowners and managers of the town's general store, post office, and probably other things I haven't discovered yet. So I would like to being some light on their roles as women landowners and some of the border issues and other issues they dealt with as land owners. Border issues include their activity with water management/water rights which is a very interesting topic. Other land issues Ive seen include grazing and lease rights and some problems they've encountered there. So for a time I was hoping to focus on them as well as two other notable local ranch women/landowners, but ultimately I decided to have the other two be a part of the background info. People have already written about them and one is a local celebrity. The celebrity is where the potential issues with supervisor will come up. We do not have the manuscript papers of Celebrity-Woman. They lie with her store/museum out further in the boonies. I contacted the store owner and asked if I could check out the papers to work on my thesis and he didnt seem too pleased with the idea, especially since he quickly ascertained Im with the Archives. Turns out he's been trying to donate the papers for years and Supervisor keeps saying she will pick them up, but never does. This has been going on for three years. While talking to me, he threatened to donate them to some museum or other I have never heard of. So he's not happy with her and the worst case scenario is that the Archives doesnt get this collection which IMO should be fairly significant. I am considering arranging a pickup with him privately. The issue will be if the collection is large. If it is, it usually means there is a large amount of junk we dont want, but historically Supervisor has taken anyway indiscriminately and therefore packed the Archives to its brim. There hasnt been space on the shelves for years and right now more and more stuff goes in piles on the floor. This includes the bane of my existence, the piles and piles of duplicates Supervisor had amassed over the years. I am not exaggerating when I call her a hoarder. She has a fairly bad case of it, and what's unfortunate about this case of hoarding is how badly it affects the workplace, which is pretty much an extension of her hoard at home. Normally hoarders only hoard over their own living spaces. So not sure what Im gunna do. If the collection is small enough and can fit in my car, maybe the best thing to do is to arrange a pickup myself. I think doing this will absolutely infuriate her, though, and will definitely cause strife. If the collection is large, that is hard too because we literally have nowhere to put it. In other news, writing my final term paper for my program has probably brought on another manic phase and Im not happy about that. Not like I am ever happy about manic phases to begin with. It was a more stressful experience than usual because I felt inundated with information. I spent a really long time writing it and it stressed me out a lot. My paper ended up being 25 pages, comparing Athenian and Spartan women. In other school news, apparently I am the first person in 22 years to do the thesis track for my program. I view it as a challenge accepted. Im a Gryffindor after all, arrogant and ballsy. Telling me "no" is just about the worst thing you can do. I really dont like taking no as an answer. Despite my main professor's attempts to discourage all his students from pursuing a thesis, he at least did understand it was important for me for him to be a part of my committee. He's probably annoyed I didnt listen to him. The head of my committee is opposite of him, she is pretty new to the school, is early in her career, and highly encourages students to pursue the thesis track. So I hope Im the first of many. Im going home to Norcal tomorrow for a week. I got to squeeze in this vacation because the library will be shut down for two days due to electrical maintenance and they gave us the days as holiday leave. So I had just enough time to take the week off. Right now, it isnt likely I'll be going home for winter break (though I probably will get to go with the parents on a trip to Wyoming), so its nice I get to go home now. Justin is snoring away and I cant sleep. At home, we have our separate bedrooms. When we share a hotel, Im *generally* ok if he falls asleep after me, but it's not the case tonight as he's exhausted himself from sleeping very badly last night. He burnt his hand while cooking yesterday evening and was in too much pain/adrenaline to sleep. Well the hotel room started leaking... almost 4 in the morning now. Better alert the staff and probably find a new room. Hopefully I'll have lots more time to update while back at home. Dreams come true... i was able to pet this calm and docile owl, Snowman, on the belly. https://flic.kr/p/243SaXQ .The first owl I held, Tamanegi (Spring Onion) was very cute, but agitated. I can't do embedded posts nor do I have the time to update, so that's all for now. Hope everyone is doing well!